Now that flash storage is becoming more popular, IO alignment question keeps popping up more often than it used to when all we had were rotating hard disk drives. I think the reason is very simple – when systems only had one bearing hard disk drive (HDD) as in RAID1 or one disk drive at all, you couldn’t really have misaligned IO because HDDs operate in 512-byte sectors and that’s also the smallest amount of disk IO that systems can do. NAND flash on the other hand can have a page size of 512-bytes, 2kbytes or 4kbytes (and often you don’t know what size it is really) so the IO alignment question becomes more relevant. It was and still is, however, relevant with HDD RAID storage – technology we have been using for many years – when there’s striping like in RAID0, 5, 6 or any variation of them (5+0, 1+0, 1+0+0 etc.). While IO inside the RAID is perfectly aligned to disk sectors (again due to the fact operations are done in multiples of 512-bytes), outside of the RAID you want to align IO to a stripe element as you may otherwise end up reading or writing to more disks than you would like to. I decided to do some benchmarks on a hard disk array and see when this matters and whether it matters at all. In this article I will however focus on the process of alignment, if you’re curious about benchmark results, here they are. In this case the RAID controller is using 32KB stripe unit and that can fit in 2 standard InnoDB pages (16KB in size) as long as they are aligned properly. 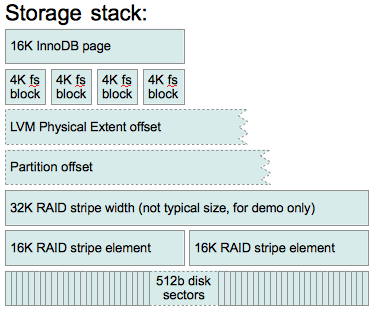 In first case when reading or writing a single InnoDB page RAID will only read or write to a single disk because of the alignment to a stripe unit. In the second example however every other page spans two disks so there is going to be twice as many operations to read or write these pages which could mean more waiting in some cases and more work for the RAID controller for that same operation. In practice stripes by default are bigger in size – I would often see see 64KB (mdadm default chunk size) or 128KB stripe unit size so in these cases there would be fewer pages spanning multiple disks so the effects of misalignment would be less significant. D stands for the disk here so the RAID has 4 bearing disks (spindles) and if there’s a misalignment on the file system, you can see how RAID ends up doing 5 IO operations – two to D4 and one on each of the other three disks instead of just doing one IO to each of the disks. In this case even if this is the single IO request from OS, it’s guaranteed to be slower both for reading and writing. You don’t need to do anything to align InnoDB pages – file system takes care of it (assuming you configure the file system correctly). I would however mention couple things about InnoDB storage: first – in Percona Server you can now customize page size and it may be good idea to check that page size is no bigger than stripe element; second – logs are actually written in 512 byte units (in Percona Server 5.1 and 5.5 you can customize this) while I will be talking here about InnoDB data pages which are 16KB in size. File system plays very important role here – it maps files logical address to physical address (at a certain level) so when writing a file, file system decides how to distribute writes properly so they make the best use of the underlying storage, it also makes sure file starts in a proper position with respect to stripe size. The size of logical IO units also is up to the file system. The goal is to write and read as little as possible. If you gonna be writing small (say 500 byte) files mostly, it’s best to use 512-byte blocks, for bigger files 4k may make more sense (you can’t use blocks bigger than 4k (page size) on Linux unless you are using HugePages). Some file systems let you set stripe width and stripe unit size so they can do a proper alignment based on that. Mind however that different file systems (and different versions of them) might be using different units for these options so you should refer to a manual on your system to be sure you’re doing the right thing. If you are using LVM, you want to make sure it does not introduce misalignment. On the other hand it can be used to fix it if it was misaligned on the partition table. On the system that I have been benchmarking, defaults worked out just fine because I was using a rather small 64k stripe element. Have I used 128k or 256k RAID stripe elements, I would have ended up with LVM physical extent starting somewhere in the middle of the stripe which would in turn screw up file system alignment. You can only set alignment options early in the process when using pvcreate to initialize disk for LVM use, the two options you are interested in are –dataalignment and –dataalignmentoffset. If you have set the offset correctly when creating partitions (see below), you don’t need to use –dataalignmentoffset, otherwise with this option you can shift the beginning of data area to the start of next stripe element. –dataalignment should be set to the size of the stripe element – that way the start of a Physical Extent will always align to the start of the stripe element. In addition to setting correct options for pvcreate it is also a good idea to use appropriate Volume Group Physical Extent Size for vgcreate – I think default 4MB should be good enough for most cases, when changing however, I would try to not make it smaller than a stripe element size. You can check where physical extents will start (or check your current setup) using pvs -o +pe_start. Now let’s move down one more level. db2# fdisk -l Disk /dev/sda: 1198.0 GB, 1197998080000 bytes 255 heads, 63 sectors/track, 145648 cylinders Units = cylinders of 16065 * 512 = 8225280 bytes ... Device Boot Start End Blocks Id System /dev/sda1 * 1 1216 9764864 83 Linux /dev/sda2 1216 1738 4194304 82 Linux swap / Solaris Partition 2 does not end on cylinder boundary. /dev/sda3 1738 145649 1155959808 83 Linux Partition 3 does not end on cylinder boundary. db2# fdisk -ul Disk /dev/sda: 1198.0 GB, 1197998080000 bytes 255 heads, 63 sectors/track, 145648 cylinders, total 2339840000 sectors Units = sectors of 1 * 512 = 512 bytes ... Device Boot Start End Blocks Id System /dev/sda1 * 2048 19531775 9764864 83 Linux /dev/sda2 19531776 27920383 4194304 82 Linux swap / Solaris Partition 2 does not end on cylinder boundary. /dev/sda3 27920384 2339839999 1155959808 83 Linux Partition 3 does not end on cylinder boundary. The rest of the task is easy – you just have to make sure that Start sector divides by number of sectors in a stripe element without a remainder. Let’s check if /dev/sda3 aligns to 1MB stripe element. 1MB is 2048 sectors, dividing 27920384 by 2048 we get 13633 so it does align to 1MB boundary. sda1 and sda3 do not even align to 1k. sda2 aligns up to 32k but the RAID controller actually has 64k stripe so all IO on this system is unaligned (unless compensated by LVM, see above). So on such a system, when creating file systems with fdisk, don’t use the default value for a start sector, instead use the next number that divides by the number of sectors in a stripe element without a reminder and make sure you’re using sectors as units to simplify the math. This is the same output we saw from fdisk earlier. Again you want to look at Start sector and make sure it divides by the size of stripe element without a reminder. Lastly, if this is not a system boot disk you are working on, you may not need partition table at all – you can just use the whole raw /dev/sdb and either format it with mkfs directly or add it as an LVM physical volume. This let’s you avoid any mistakes when working on partition table. Further down below on the storage stack there’s a group of RAID stripe units (elements) sometimes referred to as a stripe though most of the tools refer to it as a stripe width. RAID level, number of disks and the size of a stripe element set the stripe width size. In case of RAID1 and JBOD there’s no striping, with RAID0 number of bearing disks is actual number of disks (N), with RAID1+0 (RAID10) it’s N/2, with RAID5 – N-1 (single parity), with RAID6 – N-2 (double parity). You want to know that when setting parameters for file system but when RAID is configured, there’s nothing more you can do about it – you just need to know these. Stripe unit size is the amount of data that will be written to single disk before skipping to next disk in the array. This is also one of the options you usually have to decide on very early when configuring RAID. Most if not all hard disk drives available on the market these days use 512-byte sectors so most of the time if not always you don’t care about alignment at this level and nor do RAID controllers as they also operate in 512-bytes internally. This however gets more complicated with SSD drives which often operate in 4kbyte units, though this is surely a topic for another research. While it may seem there are many moving parts between the database and actual disks, it’s not really all that difficult to get a proper alignment if you’re careful when configuring all of the layers. Not always however you have a fully transparent system – for example in the cloud you don’t really know if the data is properly aligned underneath: you don’t know if you should be using an offset, what stripe size and how many stripe elements. It’s easy to check if you’re aligned – run a benchmark with an offset and compare to a base, but it’s much harder to figure out proper alignment options if you are not aligned. Now it may be interesting to see what are real life effects of misalignment, my benchmark results are in the second part. @Oleksiy – that sounds like fun! Though if partition table is aligned properly, after you create software RAID, there’s little difference what is the physical sector size since you want to align to md chunk size right? @Roman – while this depends a lot on the workload and the RAID controller, I think it’s fine to have a relatively small stripe size as long as IO is aligned (but not smaller than your working block size – 16k in InnoDB by default). When misaligned, larger stripe may make a bit more sense since that reduces chances of stepping on stripe boundaries, though your mileage may vary. My experience with this is that different controllers behave differently so there’s no right answer or rule of thumb. Especially the part about disk partition tables. stripe size than 64k on RAID10. We didn’t have enough time to discuss that matter, though. provided by disk controllers they use. Thanks for great article. Especially for the examples of mke2fs command. @Thomas, thanks. Regarding RAID1 for OS, I think it’s inefficient to let the two disks not do anything (except for the system booting). Instead I would recommend to add the two disks to the common pool, adding more spindles that way and then use partitions or logical volumes to separate OS area from data area. There are few exceptions of course – one is when some cheap disks are used for OS and 15krpm or SSDs for data, other is when there’s 30 spindles for data anyway (in which case +2 spindles makes little difference). There could be some other edge cases, but what I see very often is 2 disks out of 8 or even out of 6 used for OS and the rest of them for data — in such cases extra spindles would make a significant difference for IO bound workloads. Thanks for the informative article Care to elaborate on the not-being-fan-of-the-quite-common-standard-configuration comment ? @CaptTofu – you also have two virtual drives so it’s not clear how many physical disks go to which virtual drive i.e. you should check number of disks on the virtual drive that you’re working on (should be in the same output). For 12-disk RAID10 you would indeed use su=64k,sw=6 for xfs, though I would guess this configuration has 2-disk RAID1 for OS and 10-disk RAID10 for data (quite common “standard” configuration, which I’m not a big fan of =) in which case for data disk you should use su=64k,sw=5. thank you for letting me know that. I ran that command instead this time. So, what is the formula for determining width? It’s raid 10, so you said N/2 – 6 ? and is that 6 x 64k ? Stripe Size: The stripe size specifies the size of the segment written to each disk in a RAID configuration. You can set the stripe size to 8, 16, 32, 64, or 128 Kbytes. A larger stripe size produces higher read performance. If your computer regularly performs random read requests, choose a smaller stripe size. The default is 8 Kbytes. So 64k here is the stripe element size and the width now depends on number of disks and type of logical disk. One more thing – the output you are looking from “-AdpAllInfo -a0″ is not your device configuration, it’s just adapter defaults. What you really want to look at is “MegaCli64 -LdPdinfo -a0″, there you’ll get all the rest of the actual information about your logical disk. Aurimas: Yes, getting that utility to work was a real pain, but obtained a copy from Ronald – the RPM didn’t seem to install a working binary. BTW is MegaCli not working for the OS/Controller you’re using? I usually use OMSA with dell and MegaCli everywhere else. But 253 is out of range for the -a argument. This might be something to go to the vendor or documentation for. Wow! What a wonderful article. I’m working on this issue as we speak. I’m trying to find out the raid stripe width with megarc but not having luck. Have you any suggestions for finding out this info? Thank you for this nice article. But after trying everything, I’m going to get a new hard drive. are you saying that our SEO is very poor? 🙂 Anyways, glad you finally found it! I want konw,what the stride and stripe-width mean ? can you explain the parameter in detail ? mke2fs manual explains this quite well, but in a nutshell, stride is “the number of blocks read or written to disk before moving to the next disk”, so you normally set that to the raid volume’s strip size, while stripe-width is the stripe width, basically a strip multiplied by the number of bearing disks. As for number of bearing disks – If there are N disks in an array, on RAID10 number of bearing disks will be N/2, on RAID5 – N-1, on RAID6 – N-2, on RAID0 – N and so on.